Okay, I must admit- I’m pretty excited about this entry’s topic! First, to recap from last week, I learned that while I had been attacked by the devil through negative thoughts, self-criticism and doubt, I didn’t hear from God immediately because I wasn’t in any danger. God had been present all along and wanted me to increase my faith in Him and His ability to protect me (also resulting in God answering my prayer to strengthen my faith in Him). 1) I had never really been in physical danger. 2) And even though the devil had executed some serious attacks on my cognition, I hadn’t been in any danger mentally. I hadn’t been in any danger…. I kept focusing on that thought and as I prayed that night, I told God I would be more cognizant of the devil’s schemes as they related to my thoughts. Additionally, if I received any new attacks from the devil, I prayed that I would allow God to fight for me. My part in the battle would only involve calling out the attacks for what they really were (lies and deceit) and replace them with Truth (God’s Holy Word/Scripture). Afterwards, I was filled with this urgency towards preparation and sure enough, the next morning the Holy Spirit advised me to get even further into Scripture. Now, I will admit my days were already pretty structured. Still, I knew the importance of following God’s instruction and was determined to increase my study time. God immediately blessed me with new organizational skills so I would be able to not only incorporate His new instructions into my day, but also maintain the ability to work and not sacrifice the things I personally enjoyed (like my fiction books! You all have to read Hinds Feet on High Places by Hannah Hurnard, but I digress 😄). I realized not only did God bless me with wisdom about last week’s struggles, but He also blessed me with the weapon to fight should those attacks resurface (Praise God- He is so awesome 😀)! And to top it off- and show yet another reason why God is truly great- He directed me to strengthen one of the areas I’m most fond of- the mind! I love anything and everything dealing with cognition and mental processes. The mind and its dealings had always fascinated me, and I’d always pondered the mind and how it related to people’s behaviors. In fact, I loved the relationship between people and cognition so much that I tackled the world of higher education and became a licensed mental health therapist. Because of my interests, once I became a therapist I naturally gravitated towards the theoretical framework I felt best-explained cognition: Cognitive Behavioral Therapy or CBT. While I’m fond of and have practiced multiple therapies, CBT seems to be at the core of whatever I do. The theory’s founder, Aaron Beck, believed people conducted internal dialogue (conversations carried within ourselves) and believed we possessed “automated thoughts” or thoughts that occur naturally and “automatically” with and without our awareness. Noting a strong correlation between thoughts and feelings, Beck concluded that we often feel a certain way because of our automated thoughts. And oftentimes because we experience a certain emotion, our behaviors go on to manifest as evidence of those emotions and thoughts. 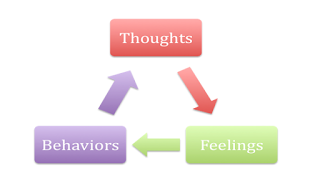 So CBT in a nutshell: We have a thought, which influences a feeling, which influences behavior. A negative thought will always produce a negative feeling. A positive thought will always produce a positive feeling. Make sense? Scenario 1: Sally enters the cafeteria and sees her group of friends talking while sitting at a table. As soon as Sally approaches the table, her friends stop talking. What would Sally think? On average, people either say, “Walk away,” or “Confront them.” (SN: The response to this question typically tells me about that person’s dominant or preferred communication style, but I’ll save that topic for another conversation 😀). Okay, now let’s go back to the cafeteria with Sally. Scenario 2: Sally’s birthday is tomorrow. Sally enters the cafeteria and sees her group of friends talking while sitting at a table. As soon as Sally approaches the table, her friends stop talking. What would Sally think? Now, what didn’t change in either scenario: Sally walked into the cafeteria, saw her friends and approached their table; her friends stopped talking. In fact, the people who answered these questions believed Sally thought her friends were talking about her in both scenarios. The only difference between the two scenarios is how Sally perceived the assumption that her friends were talking about her. In the first scenario, Sally negatively perceived her friends’ conversation. She thought negatively. In the second scenario, she positively perceived her friends’ conversation- Sally thought positively. And those thoughts, subsequently, influenced her emotions, and those emotions influenced her decisions and actions. Okay, let’s be honest with ourselves. How often do we experience negative (unproductive) emotions about a situation we think or perceive to be costly or unpleasant? What about events where we can see the benefits? Do we experience feelings that are positive? If I’m to be honest, I tend to feel negative emotions (sadness, hurt, anger, etc) about situations I deem punitive. Take last week’s struggles- I was hurt, angry, and confused with God because I thought He had let me down during a period of intense attacks by Satan. Afterwards, when God blessed me with clarity, I was able to look at those same struggles with joy and happiness. Now, did those struggles change at any point?? No! Even now, I can still look back and recall how unpleasant the attacks were. But what changed was my perception of those struggles. What I first saw as defeat, I later saw as victory because God used those struggles to my advantage (He increased my faith). For those in the midst of storms, darkness, or waiting- ask yourself: Are you looking at your situation from a negative standpoint or a positive one? Do you perceive this period as a time of challenge or a time to be challenged (as in motivated/rise to the occasion)? Simply put- are you viewing this season through the eyes of a victim or victor? Personally, whenever I look at my testing as a period of negative challenge and strife I often feel discouraged, unmotivated, and worst- depressed (absence of hope). Consequently I don’t do anything- there aren’t any fruits to bear evidence of God’s love and grace. But whenever I perceive my testing as an opportunity to learn, grow, and strengthen myself, I actually become excited! In fact, in the past, those challenges stopped chasing me- I started chasing them! I used every challenge as an opportunity to draw closer to God so that our relationship would deepen and His glory would be magnified. You believe there is one God. You do well. Even the demons believe- and tremble! In order to protect himself, Satan goes into the offense- he attacks. His defensive strategy serves in attempts to push you back, push you further from God and from your purpose. The devil is terrified of what will happen when you submit to God’s Will and Plan over your life. He wallows in complete fear and fury that God will get the glory (and please note: our Heavenly Father will always get the glory). So the devil’s best defense is offense and how does he attack??? You got it!! Through our minds! Remember, we wrestle not against flesh, but principalities. Last week during the devil’s attacks, while I had been in the wrestling ring, I never received any physical scars or bruises- it had all taken place in my mind! I had been in no real danger because I had submitted myself to God and God had been close by (James 4:7-8). I do want to note: the battle against Satan is not ours to fight- it belongs to the Lord. And while this is God’s war against evil, God does use us as His vessels in the war. During my prayer to God, I stated that I would not only be vigilant and aware of the devil’s schemes, I would boldly call out his lies. Which brings me to the last part of my prayer to God and my next topic: My role in the fight against the father of all lies (John 8:44). In the CBT environment, the therapist walks the individual through exercises that encourage cognitive reframing, the ideal of changing or shifting one’s mindset. One particular exercise, cognitive restructuring, combats automatic thoughts or processes that can have a negative (unproductive) influence. These irrational thoughts, or cognitive distortions, appear factual and truthful upon face value, but after closer inspection are determined to be misleading or false. The individual must first become cognizant, identify these distortions and then restructure their thoughts in order to strengthen or promote positivity (production). As a therapist, I encouraged restructuring based solely on truths simply because the more accurate the statements, the more willing my clients were to believe and invest in them. They were willing to marinate on the truth to the point it became ingrained in their very cognitive framework. The same concept can be applied for us within our spirituality! We must first become cognizant (aware/vigilant), and identify (call out) these distortions (lies). Relying solely on Truths (Scripture), we must restructure our thoughts in order to promote positivity (God’s love/fruits of the Holy Spirit). We must be willing to marinate on these Truths until they become ingrained in our very spiritual framework. Wanna hear some good news??? If you have an active relationship with Christ, you more than likely have already practiced restructuring on countless times! Scripture actually promotes the attitude and importance of cognitive restructuring, especially during times of testing. In fact, I would argue that Scripture gave birth to the concept of restructuring! In each scripture, the writer challenges us to look positively on circumstances that at face value seem unpleasant or negative. We are challenged to take a closer inspection of our testing- whether they come in the form of storms, darkness, or waiting-and restructure our spiritual thought process. God wants us to perceive our circumstances through His eyes, the eyes of the Victor, and not through the enemy’s eyes, the eyes of the Defeated. So as I prayed for Jesus, my Comforter, to walk with me, and the Holy Spirit to guide me through the week, I declared that I would be active in restructuring any distortions the devil attempted to throw my way. Sure enough, I progressed through the week feeling comforted and at peace. I was quick to call out any lies that entered my mind and replaced them with Truth. In addition, this week I decided to play a little defense myself! In order to stop or cancel any opportunities to complain (which is also part of the devil’s schemes), I challenged myself to restructure my words into praise. Instead of complaining, I used my voice to give thanks and offer genuine praise to my Heavenly Father. As I reflect over this week- that was in stark contrast to the previous week- I noted how much fun I had with God! I talked animatedly to Him about my day and felt tickled- as if I had the privilege of sharing an inside joke with the Almighty God. There were times when I even teased myself when I almost complained. And during those moments when I actually slipped and voiced something negative, I quickly repented, offered thanksgiving, and moved on (with a laugh, I might add). There weren’t any moments filled with intense regret and suffering as before…there weren’t any moments filled with harsh self-criticism. Because of my reframing (shift in mindset), I migrated from a place of anxiety, fear, and discontent, to a place filled with peace, joy, and thanksgiving. And finally- FINALLY- I felt another shift.... I felt the most incredible emotion of all- blessed assurance. This week, while I didn’t hear God’s voice, per se’, my faith in His continual presence allowed me to experience His peace and security as if He had been standing right in front of me. Finally, brethren, whatever things are true, whatever things are noble, whatever things are just, whatever things are pure, whatever things are lovely, whatever things are of good report, if there is any virtue and if there is anything praiseworthy- meditate on these things.